Inflammasomes are multimeric protein complexes that comprise a sensor (e.g. NLRP3), an adaptor (ASC/Pycard) and a protease (pro-caspase-1) (1). An inflammasome assembles in response to a diverse range of pathogen-associated or danger-associated molecular patterns (PAMPs or DAMPs), or perturbations in cytoplasmic homeostasis (term 'homeostasis-altering molecular processes' (HAMPs)) (2). The inflammasome platform leads to activation of caspase-1, which further induces maturation of interleukin-1β and -18 (IL-1β and IL-18) through proteolytic cleavage of pro-IL-1β and pro-IL-18. Activated caspase-1, and also the recently characterized caspase-11 non-canonical inflammasome pathway, cleave the newly discovered intracellular protein Gasdermin D (3, 4). The Gasdermin family members contain N-terminal domains that are capable of forming membrane pores, whereas the C-terminal domains of Gasdermins function as inhibitors of such cytolysis through intramolecular domain association. Caspase-1 or -11 cleavage of Gasdermin D is required for regulation of Pyroptosis: upon caspase-1/11 cleavage of the Gasdermin N- and C-domain linker, the cleaved N-terminal fragment of Gasdermin D oligomerizes and forms pores on the host cell membrane (5), leading to a cell death called pyroptosis and further activation of inflammasomes by triggering K+ efflux (6). 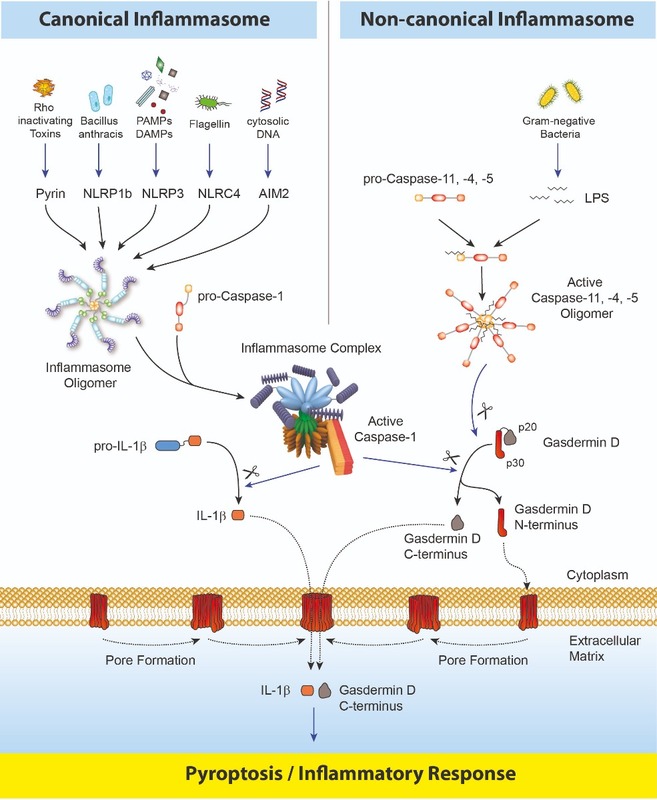 Gasdermin D forming pores regulate the non-conventional secretion of cytokines such as IL-1β, in response to cytosolic LPS and other activators of the inflammasome (7). Neutrophil extrusion of neutrophil extracellular traps (NETs) and concomitant cell death (NETosis), a particular neutrophil defense against pathogens, are dependent on Gasdermin D cleavage by caspase-11 (8). Gasdermin D-mediated pyroptosis is regulated at the level of lipid peroxidation (9) and seems to be a key effector in the LPS-induced lethal sepsis (10). Caspase-8, an upstream activator of caspase-3, controls apoptotic cell death and prevents RIPK3–MLKL-dependent necroptosis. Caspase-8, activated by the Yersinia effector protein YopJ, also triggers Gasdermin D processing and cell death with different Yersinia species (11). After formation of the pore at the cellular membrane by Gasdermin D N-terminal fragment, the role and fate of the C-terminus fragment of Gasdermin D is still unclear. Using the Gasdermin D (mouse) ELISA Kit (Prod. No. AG-45B-0011), that detects the C-terminal part of Gasdermin D (as well as the full-length protein), a signal is detected in the supernatant of cells dying by pyroptosis, suggesting that the C-terminal fragment is released from cells, either by chance due to the presence of a pore or for a specific task not yet clear. The Gasdermin D (mouse) ELISA Kit (Prod. No. AG-45B-0011) is a sandwich ELISA for quantitative determination of mouse Gasdermin D in cell culture supernatants and in cell extracts. This ELISA is specific for the measurement of natural and recombinant mouse Gasdermin D (full-length and C-terminus cleaved fragment). It does not detect human Gasdermin D.
Gasdermin D is tested from supernatants of Bone Marrow-Derived Macrophages cells (BMDMs) transfected with LPS from different knockout mice strains (see Figure 1). Only the supernatants from WT and NLRP3-/- strains contain the protein Gasdermin D. Gasdermin D is also tested from cell extracts (lysed with a Triton X-100 buffer) of Bone Marrow-Derived Macrophages cells from WT and Gasdermin D knockout mice strains (see Figure 2). AdipoGen Life Sciences' anti-Gasdermin D (mouse), pAb (IN110) (Prod. No. AG-25B-0036) is a polyclonal antibody immunised with the recombinant C-terminus domain of mouse Gasdermin D. The antibody recognizes full-length and the cleaved C-terminus of mouse Gasdermin D, does not cross-react with human Gasdermin D and works specifically in Western Blot application to detect the cleaved C-terminal Gasdermin D.
Figure: Mouse Gasdermin D (full-length and cleaved p22 fragments) are detected by immunoblotting using anti-Gasdermin D (mouse), pAb (IN110) (Prod. No. AG-25B-0036). Method: Gasdermin D is analyzed by Western blot in cell extracts of bone marrow-derived macrophage cells (BMDMs) (WT, Gasdermin -/- or Asc -/-) treated with LPS (50ng/ml; Prod. No. AG-CU1-0001) for 3h and +/- Nigericin (5μM for 2.5h, Prod. No. AG-CN2-0020). Cell extracts are separated by SDS-PAGE under reducing conditions, transferred to nitrocellulose and incubated with anti-Gasdermin D (mouse), pAb (IN110) (0.5µg/ml). After addition of an anti-guinea pig secondary antibody coupled to HRP (1/5000), proteins are visualized by a chemiluminescence detection system. AdipoGen Life Sciences is the "No. 1" manufacturer and supplier of inflammasome signaling research reagents. The validated high quality inflammasome research tools are used and published by the experts in inflammasome research on a daily basis. Recognizes endogenous full-length and activated (p20 fragment) mouse caspase-1. Recognizes endogenous full-length and activated (p10 fragment) mouse caspase-1. Recognizes endogenous full-length and activated (p20 fragment) human caspase-1. Recognizes mouse and human NLRP3/NALP3. Recognizes human and mouse Asc. anti-IL-1α (p18) (mouse), mAb (Teo-1) AG-20B-0064 Recognizes full-length and cleaved p18 fragment of mouse IL-1α. anti-Caspase-8 (human), mAb (C15) AG-20B-0057 Recognizes the p18 subunit of human caspase-8. anti-Caspase-8 (mouse), mAb (1G12) AG-20T-0137 Recognizes full-length and the p18 cleaved fragment of mouse caspase-8. anti-Caspase-8 (mouse), mAb (3B10) AG-20T-0138 Recognizes full-length and the p18 cleaved fragment of mouse caspase-8. Recognizes endogenous full-length protein and activated (p20) fragment of mouse and human caspase-4/11. Does not detect human Caspase-5. Nigericin . Na AG-CN2-0020 Potent NLRP3 inflammasome activator. N-Acetyl-D-glucosamine AG-CN2-0489 Acts as activator of NLRP3 inflammasome by dissociating the enzyme hexokinase from the mitochondria. Binds directly to Gasdermin D and inhibits the oligomerization of the N-terminus and therefore the pore formation and pyroptosis. Gasdermin D N-terminal fragment (GSDMD-N)-induced pyroptosis inhibitor. Protects against GSDMD-N cytotoxicity in macrophages or against lethal infection in mice. MCC950 . Na (water soluble) AG-CR1-3615 Potent and selective NLRP3 inflammasome inhibitor. Inhibits NLRP3-activated Asc oligomerization. Blocks priming and activation steps. BAY 11-7082 AG-CR1-0013 Reduces ATPase activity of the NLRP3 inflammasome. Prevent K+-efflux and consequently reduce Asc oligomerization and speck formation. K777 [K11777] NEW AG-CR1-0158 Broad-range cathepsin inhibitor useful for inflammasome inhibition. The most prominent function of the NLRP3 inflammasome is the processing and activation of pro-interleukin-1β (pro-IL-1β). Yet most cells do not express pro-IL-1β and thus prior expression of pro-IL-1β is required. This can be achieved by stimulating receptors such as TLRs (e.g. through LPS), Nods, TNF-Rs (e.g. through TNF-α) or IL-1R1 (through IL-1α and IL-1β) that activate NF-κB and initiate pro-IL-1β transcription. This process is called priming. Priming also induces NF-κB-dependent transcription of NLRP3. Do not bother anymore to solubilize your LPS, choose and use AdipoGen Life Sciences' homogenous ready-to-use LPS solutions. Pyroptosis is an inflammatory programmed cell death that is initiated in response to pathogen- or host-derived perturbations of the cytosol. Pyroptosis is induced by inflammatory caspases, such as caspase-1 and −11 in mice that are activated by a high molecular weight complex, called inflammasomes. Gasdermin D (GSDMD) is the central mediator of pyroptotic cell death downstream of both caspase-1 and caspase-11. GSDMD is cleaved by these caspases into a 31 kDa N-terminal fragment (GSDMDNterm) that forms pores into the plasma membrane and a 22 kDa C-terminal fragment (GSDMDCterm). This poster presents data obtained with a new Gasdermin D (mouse) ELISA kit based on antibodies developed against the C-terminal fragment of Gasdermin D (mouse).